Easter is a weekend full of treats. By mid-day you can pretty much guarantee that any children will be bouncing off the walls from excitement and sugar! But it’s often a time where parents get forgotten. So here at Bathroom Supastore we wanted to do a giveaway, just for all the parents this Easter. 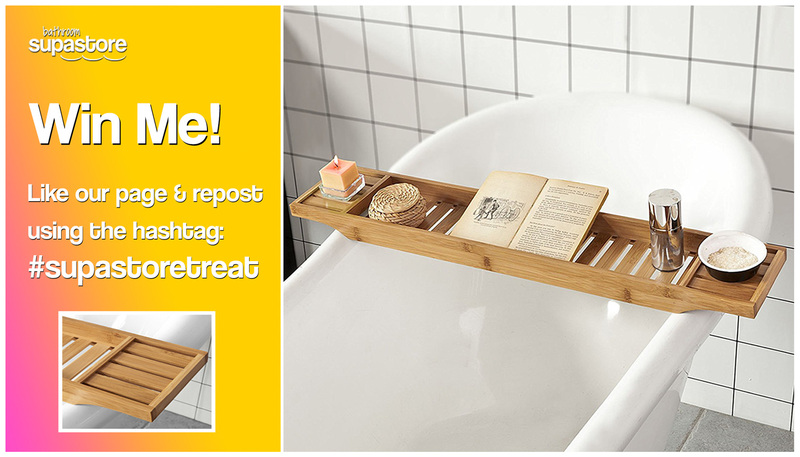 Bath Caddies are a great addition to the bathroom. Allowing you to take drinks and snacks as well as books, candles or an electronic device to the bath to help you properly unwind. The caddy has transformed how we relax in the tub, it is the ideal companion after a busy Easter weekend. As this is the time parents need to take some time for themselves, we’re giving away a beautiful bamboo caddy. The caddy will suit any room decor style from Scandinavian simplicity to traditional due to the colour and style. Head over to our Instagram, Facebook or Twitter pages to enter. The rules are simple, share the post from the page comment on your shared post with the hashtag #supastoretreat and like the page. You can enter on all 3 platforms during the competition time frame. The competition will run from 9am Friday 30th of March until midnight Monday April 2nd. Entries after this time will not be counted. Entries can be made on all social platforms, as many times as you like. You must like our Facebook, Twitter or Instagram page for your entry to count. You must use the hashtag #supastoretreat on your shared post. Winner will be announced on all platforms on Tuesday April 3rd at midday. If your account is private, we will need to verify you have met the criteria of the competition. Therefore, we would need your account to be made public between 11am and 11.30am whilst the winner is chosen. Lastly, we'd like to wish you all Good Luck!